We depend on the donation of artefacts and books to expand our exhibition display and library. 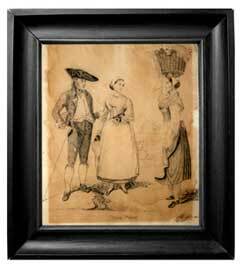 Please consider donating an original item or a facsimile of Irish Palatine interest. Portrait and photos of old farm activities, old letters and diaries, genealogy studies. Small utensils relating to Palatine homes and farms. Please remember that our Centre is an international hub where members and others come to seek information, learn and understand the story of their Irish Palatine ancestors. Many old items are eventually cast out of homes and lost for all time to future generations. 1840 illustration by Pfeiffer (Piper) depicting traditional Palatine costume. Johanna & Gabriele Weis, Germany. 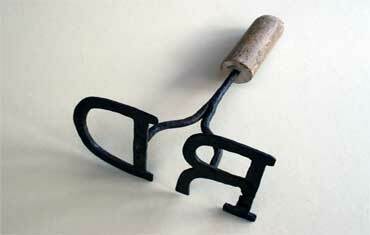 This is one of two branding irons on display.